I checked in last night with Turkish bass Burak Bilgili, who plays Don Basilio, Rosina’s oleaginous music teacher, in The Barber of Seville. Bilgili, who first sang at Seattle Opera as Banco in Macbeth in 2006, has also appeared several times with Vancouver Opera, as Don Basilio, Leporello in Don Giovanni, Banco in Macbeth and, last fall, as Raimondo in Lucia di Lammermoor—appearing opposite his wife, soprano Eglise Gutierrez, who sang Lucia. Where in Turkey did you grow up, and how did you get started in music? I come from Konya. It’s south of Ankara, in the middle of Turkey…the place where Whirling Dervishes come from. I started singing when I was very young: five, six, something like that, singing pop music, traditional Turkish songs, everything except classical music. We have several conservatories in Turkey—three in Istanbul, and also in Ankara and in Izmir. I graduated from a conservatory in Istanbul and then came to the United States, to finish my training at the Academy of Vocal Arts in Philadelphia. 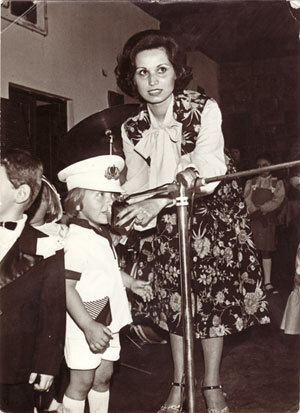 A young Burak Bilgili, shown here with his voice teacher in Turkey. You’re also a new dad—how exciting! Do you and Eglise ever sing to your four-month old daughter? Yes, I tend to sing and speak to Lucia in Turkish and sing Turkish lullabies and songs; her mother and her grandmother sing and speak to her in Spanish. And since we usually speak to each other in English, she hears that too. I have no idea which language she’s going to start to speak first. I’ve read that when a child has to triangulate among three languages like that, it can take a little longer for her to begin speaking. So you and Eglise mostly communicate in English. Do you speak or sing in Spanish? We speak in English, sometimes in Italian. I understand Spanish, but I’m not very good at speaking it. I have sung in Spanish—I did the role of the Captain in Catán’s Florencia en el Amazonas when we did it in Cincinnati. Your beautiful bass voice is a ticket to a world of evil. Devils, tyrants, oppressive fathers, wicked priests…have you ever wanted to play the good guy? So you enjoy always wreaking havoc when you come onstage? It’s true, there aren’t a lot of good guy roles for my voice type. I think Leporello is a good guy—he’s very innocent, and Don Giovanni uses him. 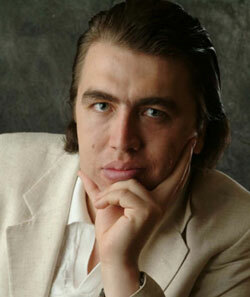 I’ve also sung Don Giovanni, I like doing that role a lot. And, let’s see, well, Banco in Macbeth, I did that here in Seattle—he isn’t wicked. But yes: I like singing Mephistophélès. 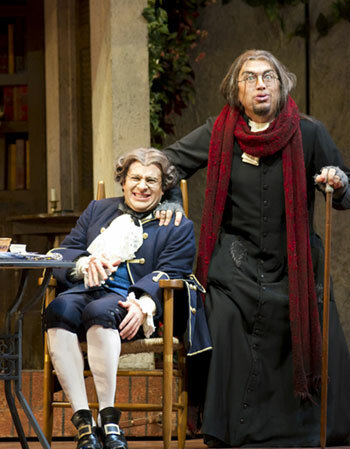 Patrick Carfizzi (Dr. Bartolo) and Burak Bilgili (Don Basilio), in Seattle Opera's production of The Barber of Seville. Tell us a little about Don Basilio. Is there anything serious, or real, about this ridiculous character? I think Basilio is a completely serious person, he’s not a clown. What he says in his big aria is real—he isn’t lying, he’s completely serious. 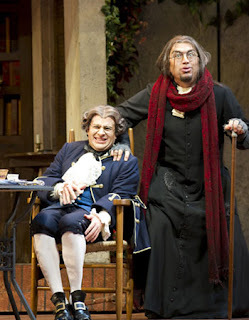 Figaro doesn’t tell the truth, but Basilio tells the truth. Basilio tells Bartolo exactly what he should do; Bartolo ignores him because he can’t accept reality, that’s all. Your big aria in The Barber of Seville, “La calunnia,” is a huge crescendo illustrating the effect of calumny and slander. How do you pace yourself so that you don’t get TOO loud? The thing is, the great composers knew what they were doing: you just follow the instructions in the score. Rossini wrote it all out: this phrase is piano, then mezzo piano, then mezzo forte, and so on. Singing loud by itself isn’t interesting; the contrast is what makes it interesting. And you can’t do this piece by getting louder, louder, and then even louder, or it will be ugly. You end up just screaming. Opera is about singing. I noticed tonight that you added a high G to the climax of your aria “La calunnia.” Pretty high, for a bass! Well, most basses.... If you can sing that note, you find a way to use it!